Length: 4 hrs. 24 min. In this world, one thing is certain: Everybody hurts. Suffering may take the form of tragedy, heartbreak, or addiction. Or it could be something more mundane (but no less real), like resentment, loneliness, or disappointment. But there’s unfortunately no such thing as a painless life. 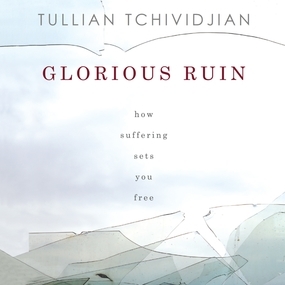 In Glorious Ruin, best-selling author Tullian Tchividjian takes an honest and refreshing look at the reality of suffering, the ways we tie ourselves in knots as we try to deal with it, and the comfort of the gospel for those who can’t seem to fix themselves — or others. This is not so much an audio book about why God allows suffering or even how we should approach suffering — it is an audio book about the tremendously liberating and gloriously counterintuitive truth of a God who suffers with you and for you. It is an audio book, in other words, about the kind of hope that takes the shape of a cross.